According to a new IBM Research study titled, "Why Advocacy Matter to Grocers", Grocers are failing to build loyal customers in US. The study analyzes the factors driving customer advocacy and recommends grocers to better differentiate themselves in an increasingly competitive marketplace. It could be said that the retail food industry and its customers have a lot to be optimistic about. Customers have more choices: more products, more ways to buy groceries and more convenience; and the industry has experienced solid, consistent growth over the past decade. Most of this growth, however, has come at the expense of traditional supermarkets as they watch their customers go to supercenters, wholesale clubs and specialty and boutique food stores. 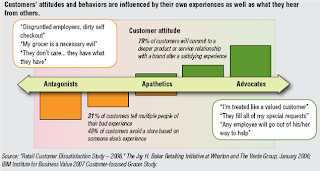 Worse, customers of traditional supermarkets, on average, have a negative attitude about their grocers. According to our new consumer survey about the retail food industry, 73 percent of customers feel either antagonistic or have no loyalty to their store. That leaves only one in four as a customer advocate – a truly loyal customer who would recommend his grocer to others, stick with the store despite competitive offers, and purchase from that store regularly. This paper discusses the attitudes and behaviors that turn customers into advocates as well as what grocers can do to improve the level of advocacy among their customer populations. The perspectives here are based on our provocative 2007 IBM Institute for Business Value Customer-focused Grocer Study, which provides a new approach to understanding customer attitudes based on input from over 6,000 consumers. 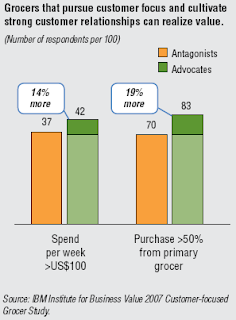 more advocates than antagonists spend more than US$100 per week with their primary grocer. Advocates are also more loyal. 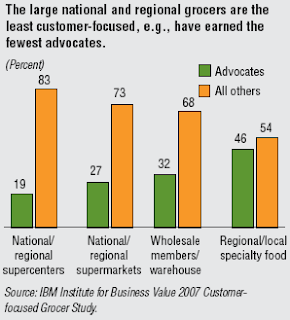 Nineteen percent more advocates give the majority of their business to their chosen grocer (see Figure below). Conversely, more than twice as many antagonists (14 percent) as advocates (6 percent) decreased the amount they purchased from their primary grocer over a two-year period. Across grocery categories, supercenters fared the worst, with only one in five customers being advocates (see Figure below). The low score may be the result of the customer experience being sacrificed to focus on lower prices. Interestingly, wholesale and warehouse clubs had much higher advocacy rates despite their similar practices of focusing largely on price..
What that means is that big retailers are not doing well maintaining a loyal customer base. Generally, grocery customers concur on areas that are most important to them. This means the attributes important to advocates are the same ones that are important to apathetics and antagonists. All three groups strongly agree that the essential attribute for a grocer is quality; others include selection, convenience, employees, availability and social responsibility. In fact, the relative ranking of nearly all 15 attributes are the same across the three groups. Understand customer needs and expectations from the outside in: Place high priority on having deep insights into shopping preferences and needs to create a satisfying shopping experience for core customer segments across all channels and shopping venues. Use customer insights to drive business operations: Drive these insights across the business to optimize all key decision making, including buying merchandise, pricing and promoting products and services, serving customers, marketing and communicating to customers. Break traditional design constraints: Design processes based on how customers interact with the grocer, not how the grocer wishes to interact with customers. Incorporate relationship and communication skills in the learning and development of staff and leaders. Adopt a transformational change mindset: Embrace the notion of becoming customerfocused. Measure what’s important to the customer and share results companywide, restructuring as needed to align management and incentives to embrace customer knowledge and reward advocacy. Prioritize investments based on what really counts: Prioritize investments based on criteria that define a successful shopping experience for the company’s best customers.